Cruising with kids for the first time? Learn from the pros with these smart travel tips. Plan ahead, pack the right stuff, and prepare for the biggest adventure of your life! Pack an over-the-door shoe holder to maximize your cabin’s counter space and keep toiletries, etc. organized. Bring over the counter meds with you, as purchasing them onboard the ship can be very expensive. Stick a large magnet on the outside of your stateroom door so that kids can easily identify their cabin. So many activities! Bring a highlighter to mark the ship activities that you want to do each day. Pack lanyards to keep track of your cruise cards. You’ll also need an inexpensive beach bag or backpack for on-shore excursions. Cruise cabins can be short on outlets – bring a surge bar so that everyone can charge their cameras and phones. Don’t want to shell out for the text plan on the ship? Bring walkie-talkies for everyone instead. So much fun! Plan a day of beach fun for everyone at Playa Mia. 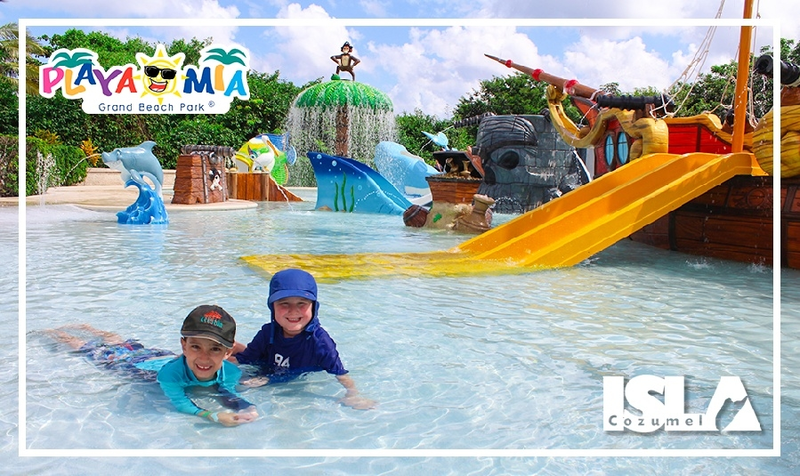 With 20 included services and activities, our water park and beach is ideal for cruise travelers with kids. Want to know more Cozumel travel tips? Please contact us today! Website design, hosting & internet marketing by Milestone.